[Editors Note: The issue of social security is prevalent in our lives today. But this has always been a concern. In exploring our town’s archives, Rich Church has come across information about how people met the needs of being cared for in their later years. In this article (and another to be published in the near future) Rick shows us what solutions were put in place. Families moving to a frontier town like Packersfield employed a number of strategies to sustain themselves. They often came with others they knew from their hometowns and settled near one another in their new home. Often those clusters of new arrivals were related. In the second generation they often took steps to keep the farm in the family and provide for their old age. The Sawyer Family who settled in the northeast corner of Packersfield did all of these things. 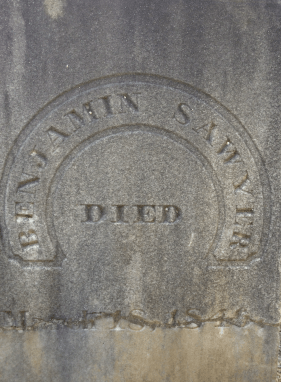 Benjamin Sawyer was born in Amherst, New Hampshire in 1758 to Josiah and Hannah Sawyer. Benjamin married Tabitha Kitteridge of Tewksbury, Massachusetts in 1778 when he was twenty and his wife a year younger. 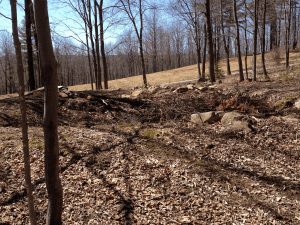 45×40’ stone foundation for the home of Benjamin and Tabitha Sawyer and their 14 children. Their first child, Benjamin, was born in Amherst in 1779. 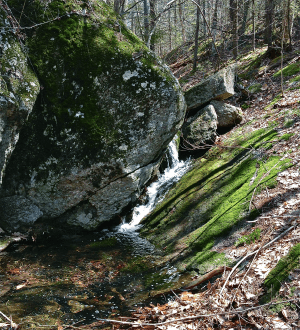 That year the young family bought 104 acres on the western side of Rollstone Mountain from Benjamin’s father and moved their child, two horses, bed, teakettle and other possessions on horseback to Packersfield. A cousin of Tabitha’s on her mother’s side, Solomon Ingalls, owned 104 acres nearby and soon moved into the neighborhood. Nathaniel Barrett, another neighbor from Amherst joined them in 1778. 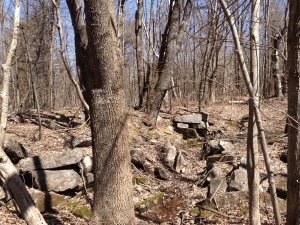 Tabitha’s brother, Solomon Kitteridge bought another 104-acre lot and joined them in 1781. Children for the Sawyers came every year or two and totaled 14 with all but two reaching adulthood. By 1810 Benjamin and Tabitha were in their early fifties. They had accumulated a large farm with over 200 acres; their daughters were marrying, their sons moving away to establish farms of their own. They had four children still living at home. The oldest of these, Joel, had been married a year and was certainly trying to figure out where to settle and how to acquire his own farm. The Sawyers used a “maintenance contract”, a device used in England as far back as the 12th century, to keep Joel on the farm and provide for their own old age. They sold Joel a half interest in their farm in return for a lifetime of care. The details reflect a carefully thought out plan and the items needed to sustain life on a largely self-sufficient New Hampshire hill farm of the time. The agreement provided for all that Benjamin and Tabitha would need for the rest of their lives, provided for their remaining unmarried daughters, for their care and for their funeral expenses. It also anticipated three remaining phases of their lives: full ability to work the farm, semi retirement, where they kept some animals, and old age. For the first four years of the agreement father and son split the costs and labor of running the farm. Joel built a house on the farm for himself and his family. Benjamin provided the other half of these expenses. The two generations shared the result. This is both a list of the necessities for an early Nelson farm family, but a list of the normal product of an early nineteenth century farm. The elder Sawyers were provided with cows for milk, butter and cheese. Two cows was a common number on an 1815 farm. Two meant having a constant supply as their breeding cycle could be managed for a constant supply of milk. Tabitha Sawyer was expected to spin the flax into linen and the wool into yarn. She was to weave the cloth and make the clothes. The only items in the list not produced on the farm were likely the salt, shoes, boots and harness. This suggests that Fanny was not expected to marry. She may have been incompetent or disabled. The arrangement seemed to work for both parties. Benjamin sold his son the other half of the farm in 1816 taking back a mortgage for the full amount. Benjamin died in 1846 and Tabitha in 1845. They were eighty-eight and eighty-seven. They outlived their son, Joel, who died in 1832 aged 45. Joel JR seems to have managed the farm in his father’s stead. He bought the farm from his mother, Susannah in 1846. 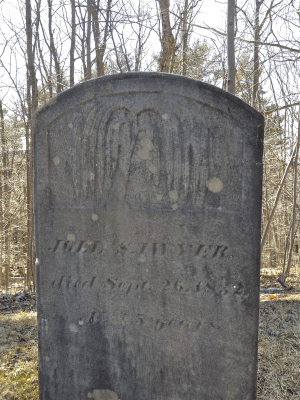 Joel JR moved to Mason, New Hampshire and the farm passed out of the family with his death in 1857.